HOUSTON – (By Dale King, Realty News Report) – Just hours before four police officers were shot in narcotics operation Monday afternoon, city officials broke ground on a new police tactical training center. The Houston officers remained hospitalized Tuesday at Memorial Hermann, with two officers in critical condition. Two suspects were killed as gunfire was exchanged with police at a home in the Pecan Park neighborhood in southeast Houston. 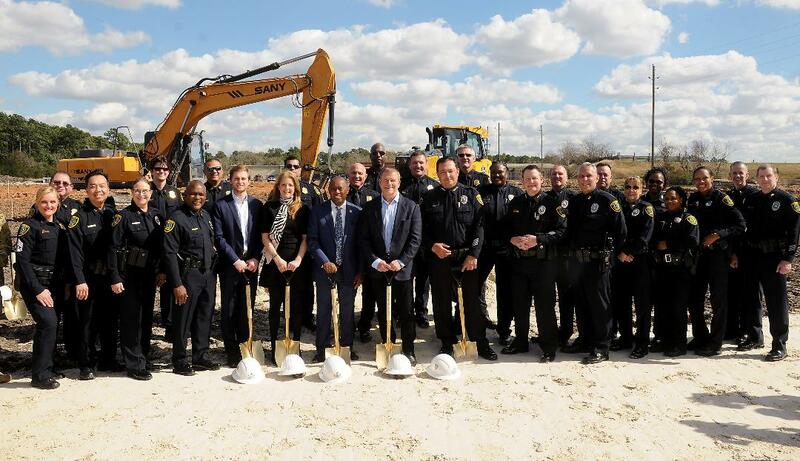 Earlier in the day, officials presided over the commencement of construction on a police training center at 17000 Aldine Westfield Road, near Bush Airport. The training center will boost the availability and frequency of “reality-based training” with technology and scenario-related instruction to mitigate homeland security risks. The facility will include a village of various building types where officers can prepare to tackle emergency situations or terror threats. The Houston Police Foundation commissioned the design and construction of the 44,000-SF facility that will be named the Tilman Fertitta Family Tactical Training Center, honoring the Houston billionaire and businessman who donated $2.5 million to build the center that carries a price tag of $10 million. Longtime chairman of the board for the Houston Police Foundation, Fertitta is CEO and sole owner of the Houston-based Landry’s Restaurant chain, the NBA’s Houston Rockets, the Golden Nugget Casinos and Hotels and other hotels and entertainment properties. Fertitta is host of the “Billion Dollar Buyer” reality TV show on CNBC. Fertitta and his family joined Mayor Sylvester Turner, Houston Police Chief Art Acevedo and dozens of local police officers at the construction site on the north side of Houston, adjacent to the Houston Police Academy campus. The two-story building was designed by Ziegler Cooper Architects of Houston. When completed in December of 2019, the Fertitta Family Tactical Training Center will provide space and technology to train officers in how best to respond to the modern challenges and conditions that police face, such as active shooter, hostage and terrorism situations. “Whether in a night club, hotel, bank, a place of worship, workplace or at school, active shooter scenarios play out in devastating ways across our nation,” said Chief Acevedo. He said the fourth quadrant consists of traditional training rooms and a simulations system that provides practical skills improvement in a virtual environment. Administration offices will also be located in this part of the building. “While we are well-known for our expertise with many forms of urban architecture, we also have a deep concern for the welfare of our communities and have a good deal of experience with public safety projects,” said Ziegler Cooper’s Steve Lucchesi, architect in charge of the project. According to the Houston Police Foundation, the tactical training center is a critical step toward ensuring a safer tomorrow for Houstonians and is urgently needed in the fourth largest city in the United States. Mayor Turner said the center where officers will hone their skills is only the fourth such training facility in the United States. Others are located in Washington D.C. and Fort Worth, as well as the famous “Hogan’s Alley” FBI training facility in Quantico, Va.